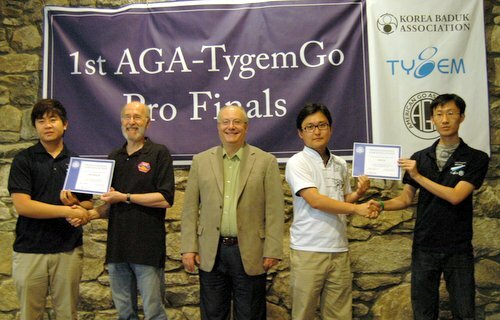 Gangsheng Shi (far left) defeated Jianing Gan Saturday morning to become the second US-certified professional in the AGA-TYGEMGO Pro Finals that concluded today in Black Mountain, NC. Shi and Andy Liu won professional certification and $1,500 each in prize money. “You both played beautifully and really earned this honor,” American Go Association President Allan Abramson (second from left) said at a special welcoming ceremony Saturday afternoon with tournament organizer Myungwan Kim 9P (second from right) and TD Jeff Shaevel (center). Kim outlined the rights and responsibilities of a professional go player to the newly-minted professionals as they sipped organic green tea from US-made cups. “You’re eligible to play in major Korean tournaments as well as other tournaments where US pros are invited,” Kim said. He also discussed the “high expectations” of professional go players, noting that “You are not individual go players any longer, you are now representatives of the AGA and the US go community.” The two nodded solemnly, looking a bit overwhelmed. Here’s the final set of results from the AGA-TYGEMGO Pro Finals, including all standings and prizes. For latest standings and game records, click here and scroll down to Results.